Phantom prides itself on providing the very best in tracking solutions and customer service. All of our stolen vehicle recovery products are Thatcham approved which provides discounts on insurance premiums. 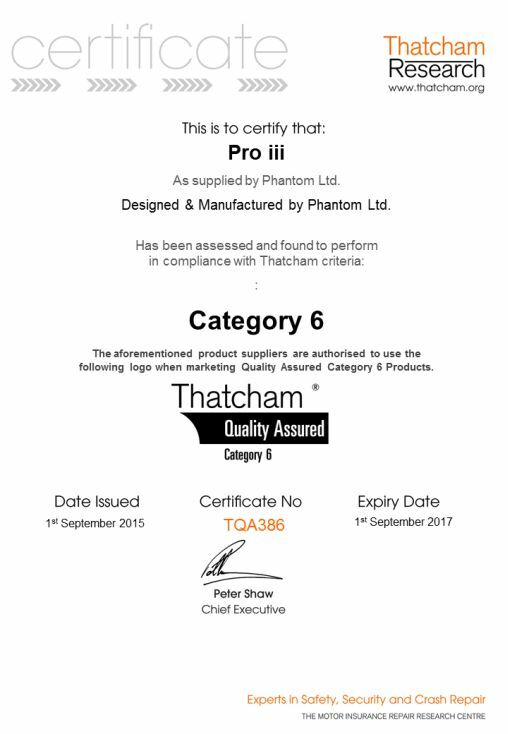 This means that our products have passed Thatcham's in depth tests and have been found to meet a standard that has become the international milestone in crime prevention. Why do I want a Thatcham approved tracker? Since 1992 Thatcham have been testing and approving security systems and is the leading authority in the on security products and security systems for the automotive industry. Thatcham Approved Trackers are GPS Vehicle Tracking Devices that have passed all of Thatchams numerous safety and security tests, which have proved their safety and effectiveness in the field. Our products have passed all of our Thatcham's rigorous safety and security tests. By choosing one of our Thatcham approved Trackers you know that as well as security and quality you are getting a product that can give you peace of mind. Call us on 0161 219 4299 for sales or 0161 476 4050 for any other enquiry or use the form on our Contact Us page to get in touch and see if we can help save money and time for your business.